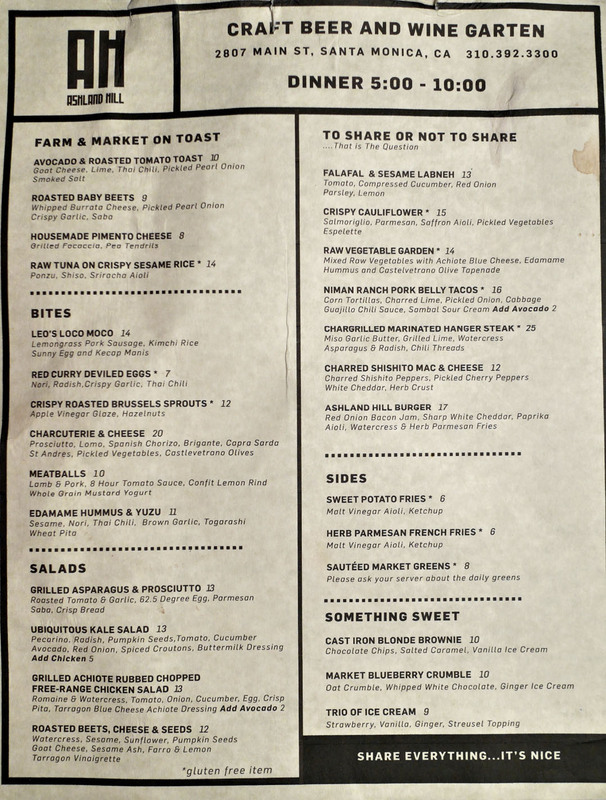 Soft opened on January 30th, Ocean Park's Ashland Hill comes to us courtesy of Fork n' Awesome Hospitality Group (the guys behind Ox & Son) and co-owner Luke Tabit. 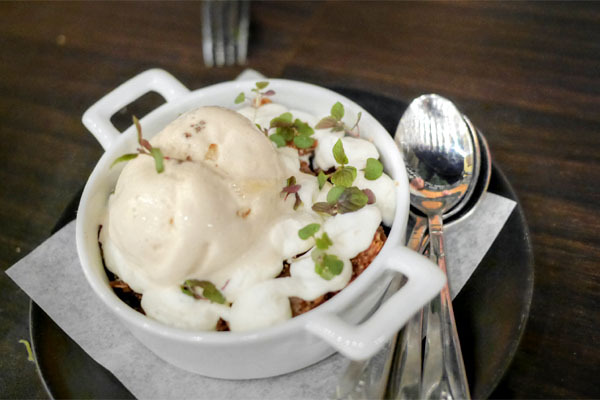 Helmed by FNA chef Brad Miller, AH aims to be a modern beer garden of sorts, one that we've wanted to try for a few months now: we'd actually wandered over after a meal at Scopa Italian Roots, but were told that the place had already closed for the evening. 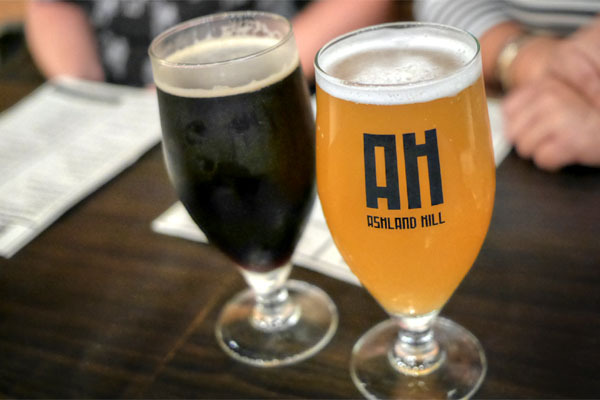 Ashland Hill takes over the old Wildflour Pizza space, which has been transformed into a casual beer-slash-wine garten setup, with a cozy tap room up front and a great patio out back. Tabit's in charge of the beverage program, and in terms of beer, he's got 16 taps (mostly local) and a handful of bottles, though nothing too interesting unfortunately. Wine-wise, things tend more toward international, with a dozen or so wines by the glass/bottle, and a few more on draft. 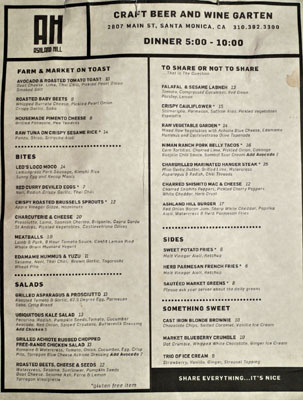 As for the food menu, think seasonal-ish bar bites alongside more substantial dishes. Brunch is also an option. Click for larger versions. 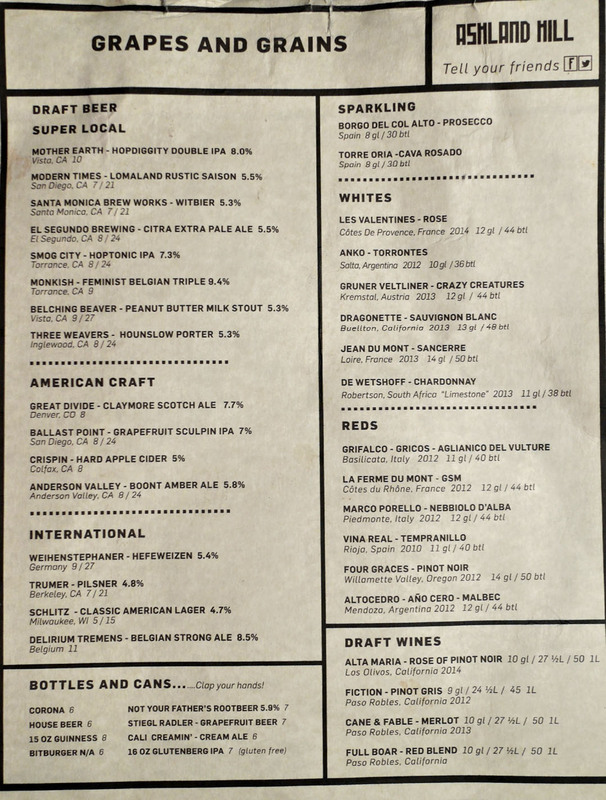 We got started with a couple beers off the tap list. On the left was the Three Weavers - Hounslow Porter [$8], sort of a prototypical, dry-ish porter with classic flavors of pronounced chocolate and malt throughout, joined by a slight bitterness--nothing special. Meanwhile, the Santa Monica Brew Works - Witbier [$7] was definitely not your prototypical witbier. I found it grainy, malty even, with a dankness that I didn't enjoy, along with a smoky character toward the back end. It lacked the crispness, citrus, and spice that you're supposed to have in a wit. Not a fan, nor should you be. 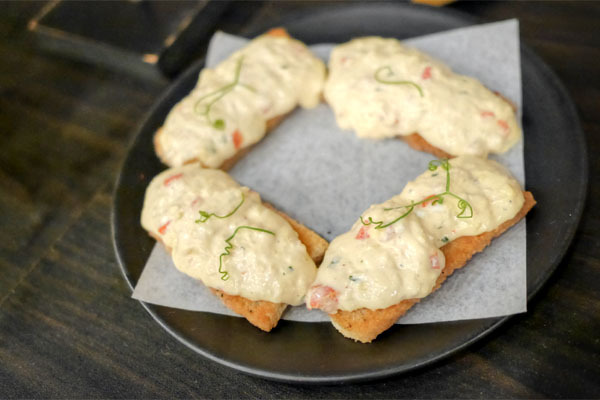 I enjoyed Ashland's take on pimento cheese, a clever rendition that ate creamy yet tangy, with a fantastic complement in the form of that rustic focaccia. 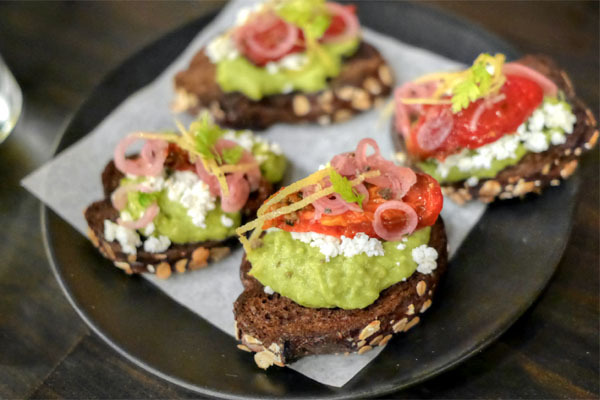 The toasts did a nice job showing off the lushness of avocado, pairing it with a lactic component from the goat cheese. Uplifting the dish were the pickles and lime, imparting a sense of balance to things. Given the lackluster beers preceding, we cut our losses with the stuff on draft and proceeded to BYOB it. 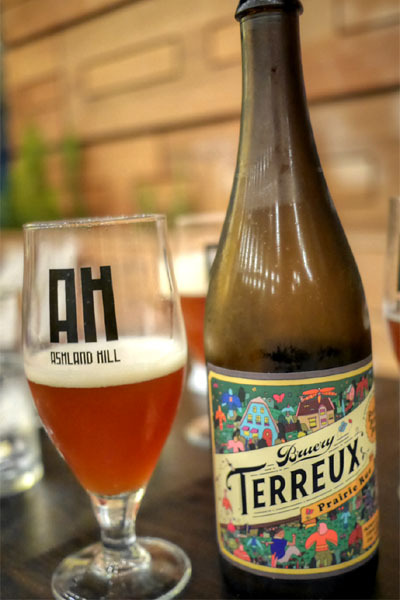 First was the 2015 The Bruery Terreux Prairie Rue, a farmhouse ale fermented with Brett in oak barrels, brewed in collaboration with Prairie Artisan Ales. It was delicious, much better than I thought it'd be actually. Tart fruit and aromatic citrus on the nose. The taste conveyed a base of malty, bready flavors linked to barnyard funk and hoppy-citric bitterness, the oak coming through later. Complex, and very well integrated. 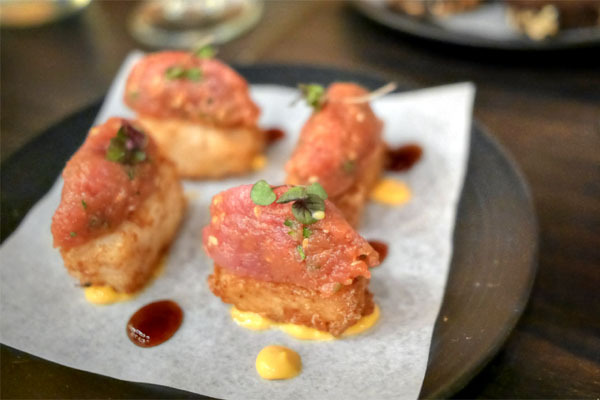 Tuna arrived clean and slick, with a subtle ocean-y quality that made sense with the fish's base of crispy rice. Nice spice underpinning the whole experience as well. 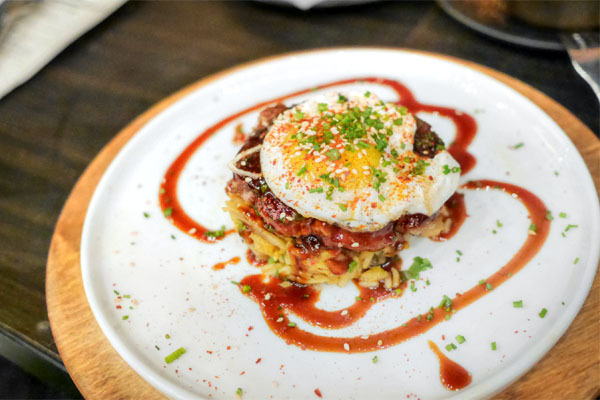 The loco moco hit the mark, a cozy sort of dish that really meshed together the herby, soy-enriched sausage with the acidity of kimchi and that runny egg, a pervasive sweetness tying everything together. Nice. 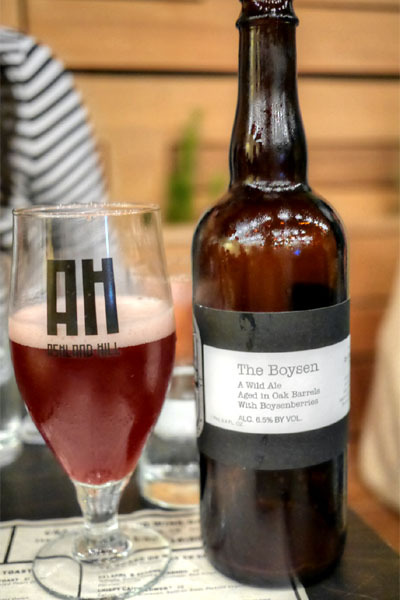 Next, I busted out a 2015 de Garde The Boysen, a two-year-old barrel-aged wild ale, refermented with boysenberries, then blended with one-year-old "lambic." It was damn tasty, definitely sharp and funky to the smell, with a flavor profile that veered sour and earthy (with a hint of band-aid and oak) at first, the base of fruit coming in toward the midpalate and lingering on the back end. 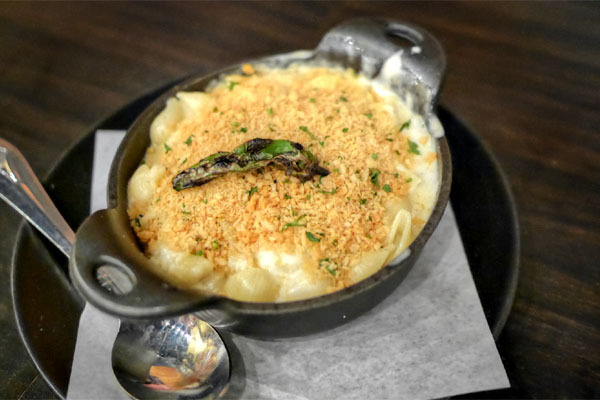 The classic mac delivered, with its traditional cheesiness taken up a notch by the spicy, persistent undertones of shishito. Nice crispness from the crust, too. 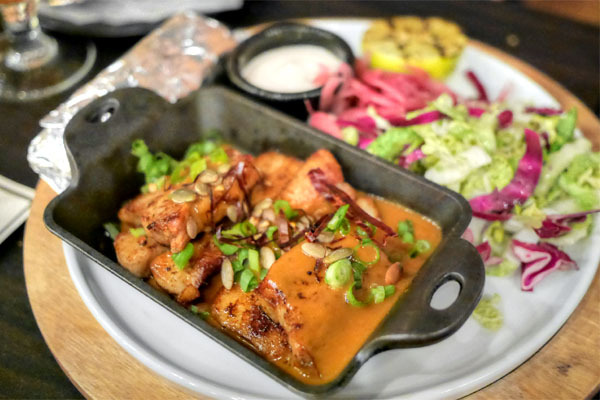 Pork belly wasn't quite as fatty as I'd hoped for, though it still made for some satisfying tacos. Some great accompaniments here, especially the bright, crunchy veggies and that zippy guajillo salsa. 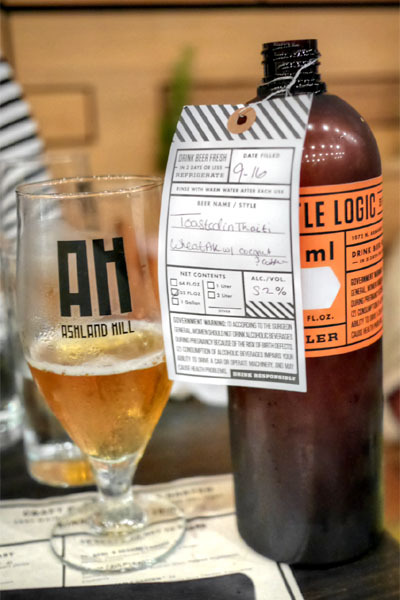 One of my dining companions had brought along a small growler of 2015 Bottle Logic Toasted in Tahiti, a pale ale with roasted coconut and coffee beans. Lots of coffee at first, transitioning to more of a tropical, astringent edge that kept reminding me of urinal cake, disturbingly. Borderline disgusting--I have no need to drink this ever again. AH's take on hummus was one of the standouts for me. 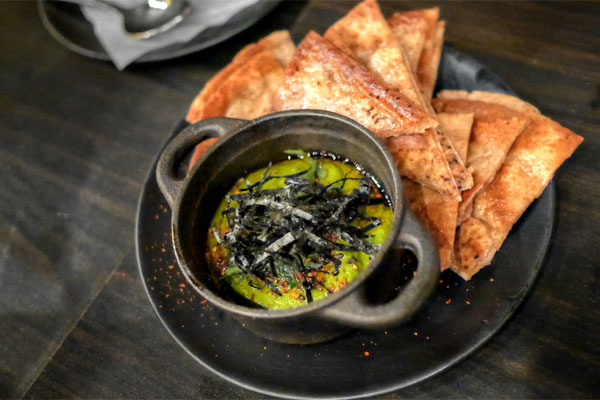 I loved the seaweed-laced, umami-rich, Japanese-y depth of the actual spread. It was delicious alone, and made for a perfect pairing to the crispy, charred pieces of pita included. Cauliflower was a must-try of course. Lovely fried texture and savoriness on the actual veggies, and I appreciated the tartness of the pickles as well as that citrusy salmoriglio. 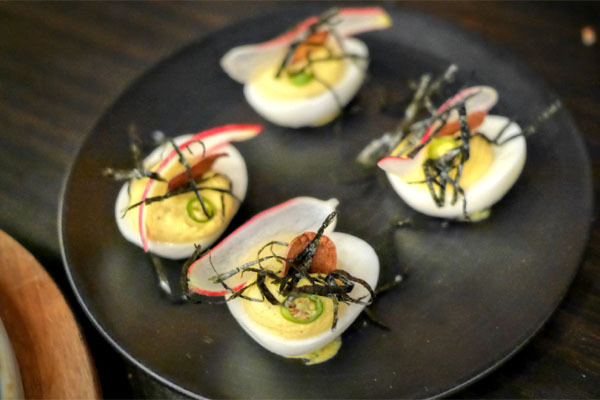 I'm a big deviled egg fan, and these were an unconventional take on the classic. Strong curry presence to go along with the richness of the yolk, the whole thing boosted by a prickly bit of heat. 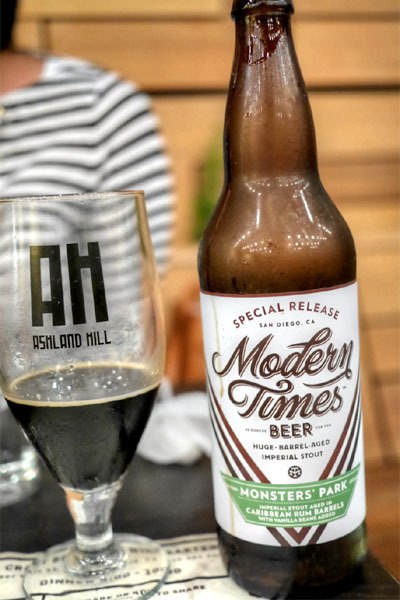 Our final beer was an imperial stout, the 2015 Modern Times Monsters' Park aged in Caribbean Rum Barrels with Vanilla Beans, part of a 750-bottle release from May. Sweet, aromatic notes of vanilla on the nose, joined by an underlying layer of cacao. On the palate: loads of spicy rum-soaked dark fruit over a base of chocolate-y malt, the vanilla coming through later and lasting long on the close. A delicious and dessert-y vanilla stout, though not quite as decadent as the benchmark Vanilla Rye. 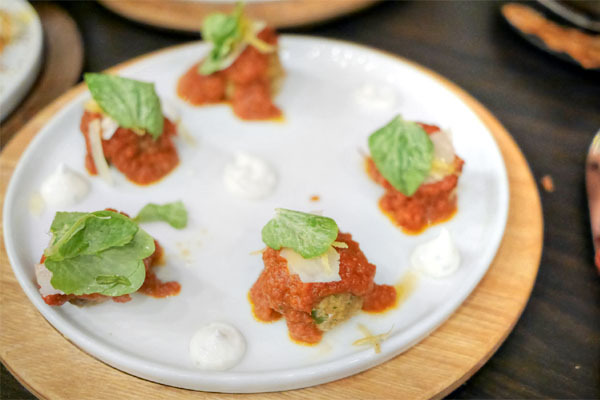 We always tend to order the meatballs when they're available, but these were a bit of letdown unfortunately, coming out dry, mealy, and not particularly flavorful. The tangy tomato sauce, the yogurt, the cheese--they all made sense, but the star of the show just missed the mark. We finished with a lone dessert, one that worked itself out with a smart balance between sweet blueberry and zesty ginger. Great textures and crunch here, too. Our entire party was actually very satisfied overall with the food here. 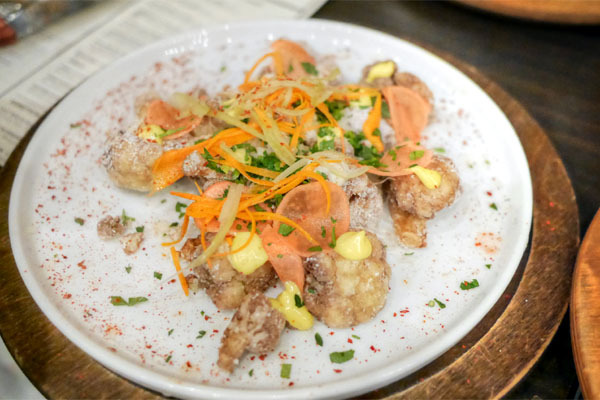 It's beer-appropriate fare, but incorporates just enough cheffiness to keep things interesting. Loved the outdoor ambiance as well, and the service (though limited given the format) was on point too. 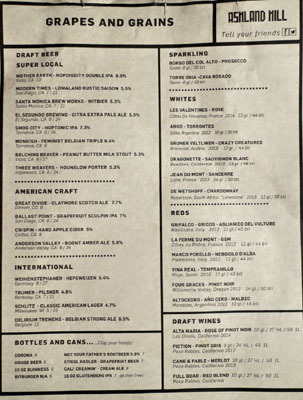 The tap list, however, was mediocre, especially since Ashland Hill bills itself as a beer-centric place. Really nothing of interest there at all--not a single sour, not a single barrel-aged beer, not a single one that I really felt the urge to drink.